HILLSBORO — It was a game of big plays. Big offensive plays. Big defensive plays. But, while the big plays were many, and thrilling, at the end it came down to just one play — and one yard. And the Tualatin High School football team, try as it may, wasn't able to get that needed yard. 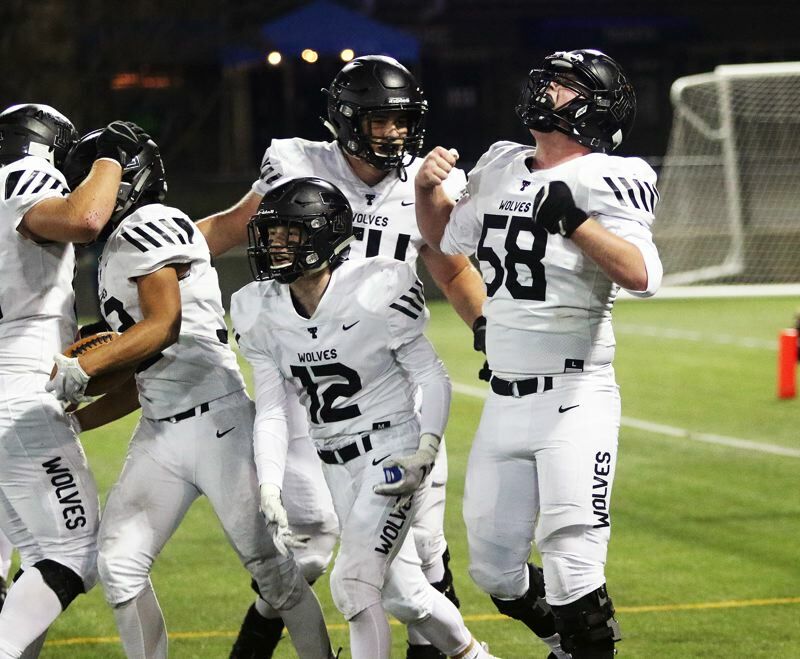 The Timberwolves, fumbling the ball on fourth-and-goal from the Central Catholic 1-yard line in overtime, were edged 28-21 by the Rams in a Class 6A state playoff second-round thriller played Friday at Hillsboro Stadium. "It's hard. 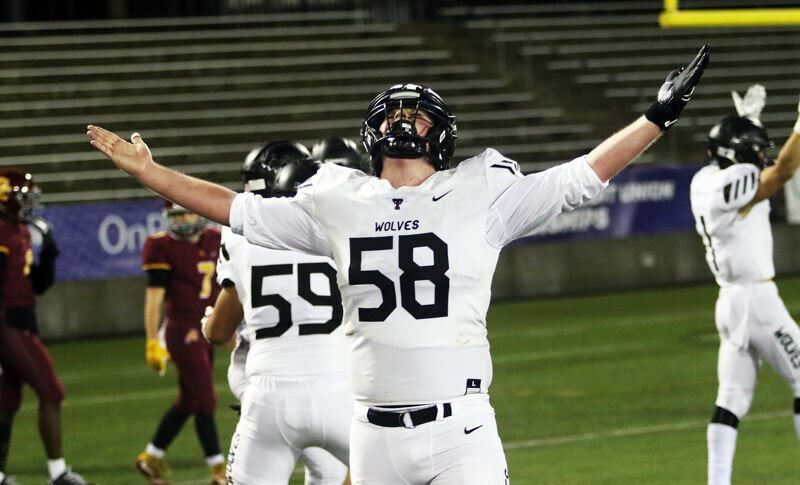 The things that got us all year got us tonight," Tualatin coach Dan Lever said after the game. "But I'm so proud of our team. I'm proud of the kids. And, like I told the kids, it hurts so bad right now because it was so fun." 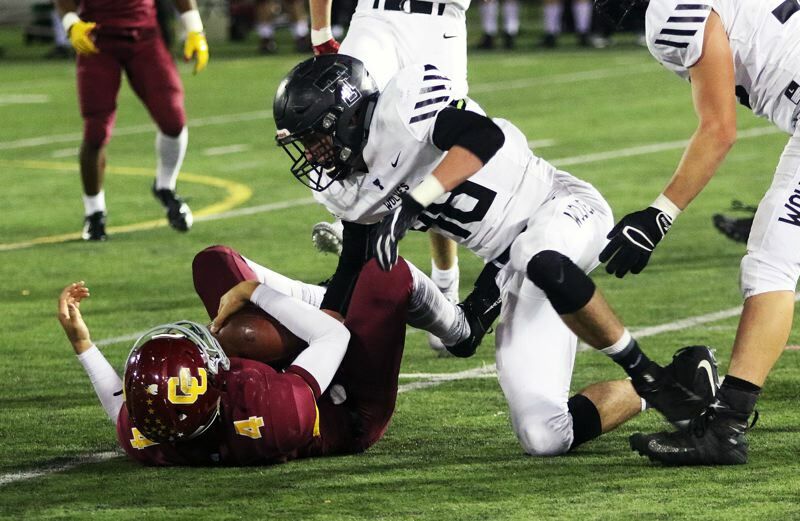 "We were ready to play them," said Tualatin senior linebacker Garrett Boespflug, who had an interception and a quarterback sack in the contest. "We played hard, everyone did. We all gave it our all. Everyone is hurting, because we all gave it our all." 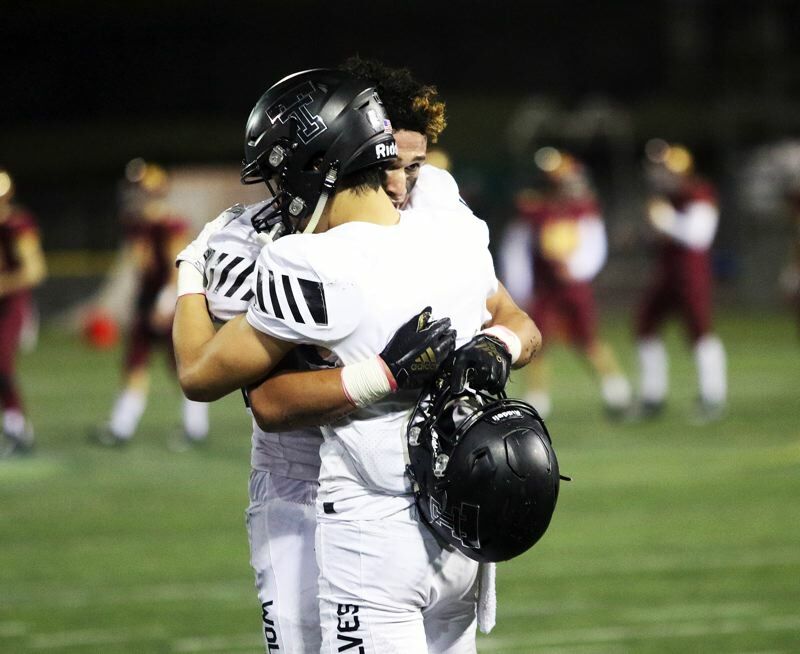 "We got to the second round of the playoffs, going to overtime, and losing by seven," said Tualatin senior receiver/defensive back Jett Searle, who scored the game's first touchdown. "We might not have won the game, but I feel like we still played our hearts out." With the win, Central Catholic, the No. 2 team out of the Mt. Hood Conference and the No. 7 team in the final OSAA power rankings, improved to 7-4 on the season. 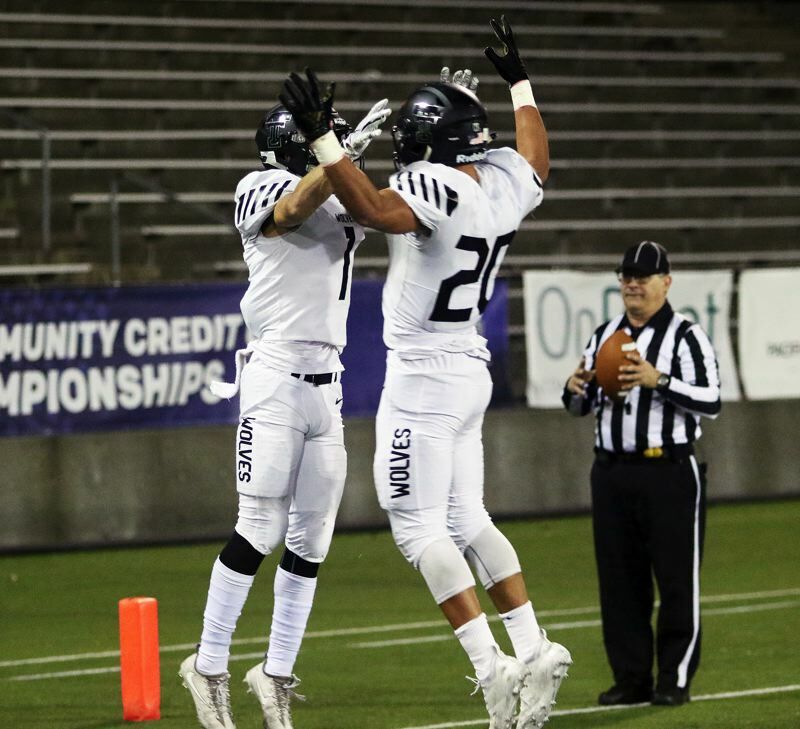 The Rams also advance to the quarterfinal round of the Class 6A state playoffs, where they'll play at top-seeded Lake Oswego on Friday. 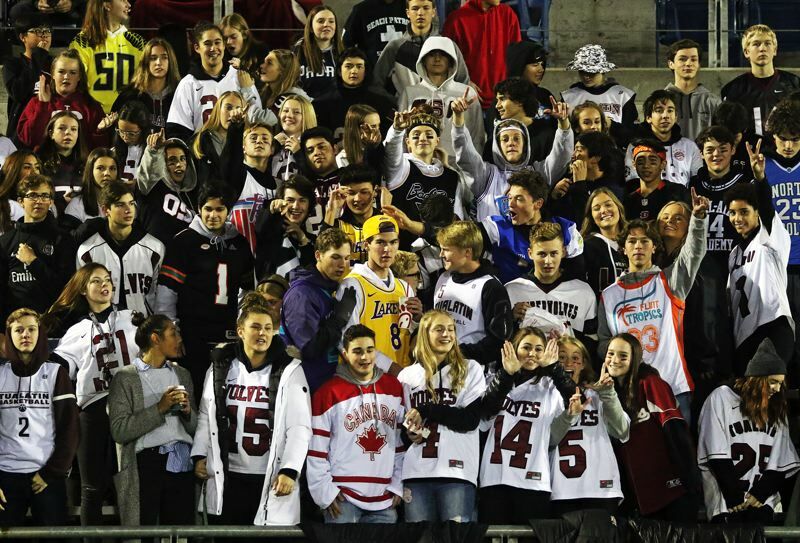 Tualatin, the No. 5 team out of the Three Rivers League, and the No. 9 team in the power rankings, finished its season with a final overall record of 7-4. "It's been amazing," Boespflug said of the season. "It's a great group of guys, and I loved playing with them. I can't describe how great it was. I'll never be on a team like that ever again." 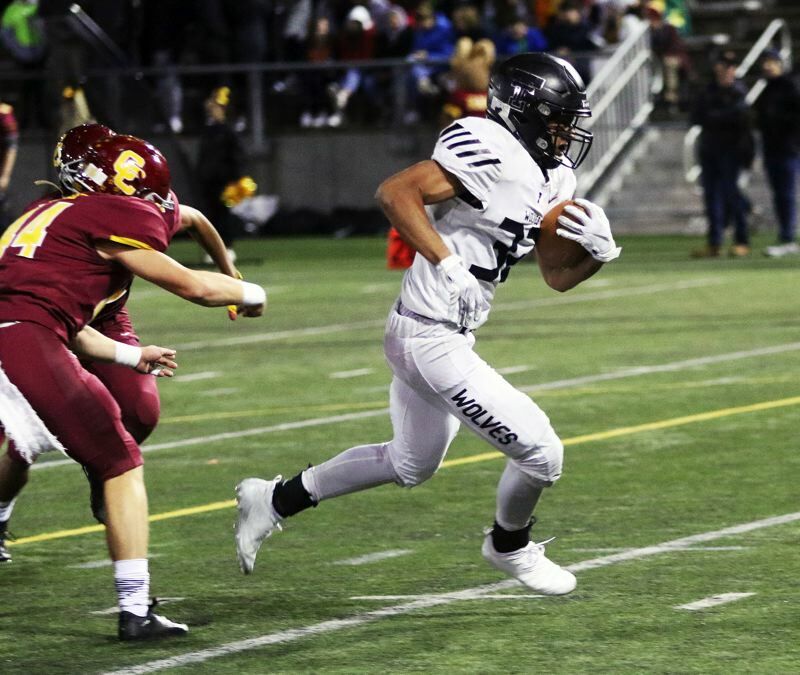 "We've had a lot of people doubt us, and we showed that we can play with anyone," Tualatin senior running back Dominique Loggins said. "The heart is what we take most pride in. If we don't want it, then why play the game?" And the Timberwolves, right from the start of Friday's second-round game, showed that they wanted it. 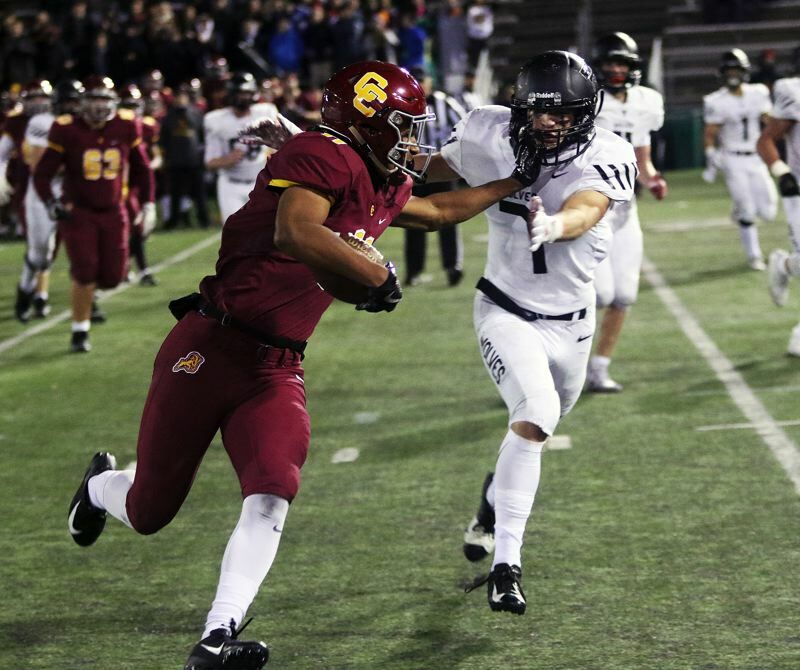 Central Catholic, in the game's first possession, drove down to the Tualatin 27-yard line. 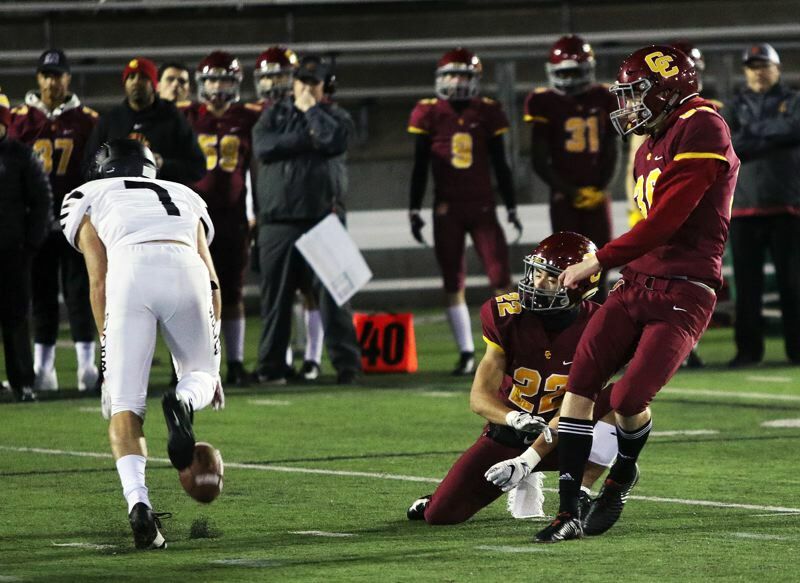 But that's when the Wolves' defense stepped up, forcing the Rams to try a 44-yard field goal, which was blocked by Tualatin junior Luke Marion. 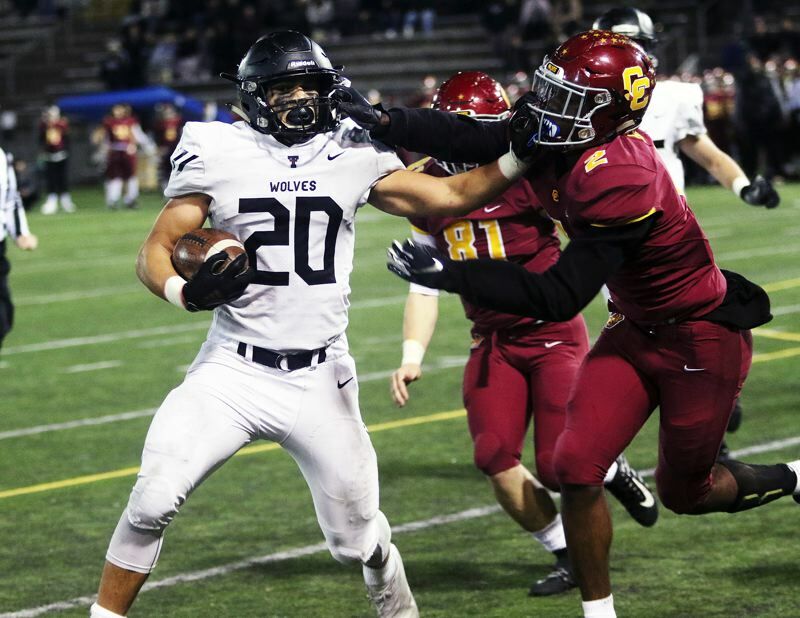 The Timberwolf defense would step up again on Central Catholic's next possession, with Tualatin junior linebacker John Miller stopping Central Catholic junior running back Elijah Elliott for no gain on a fourth-and-goal play from the Timberwolf 3-yard line on the first play of the second quarter. That was just one of many big plays Miller would have in the contest. 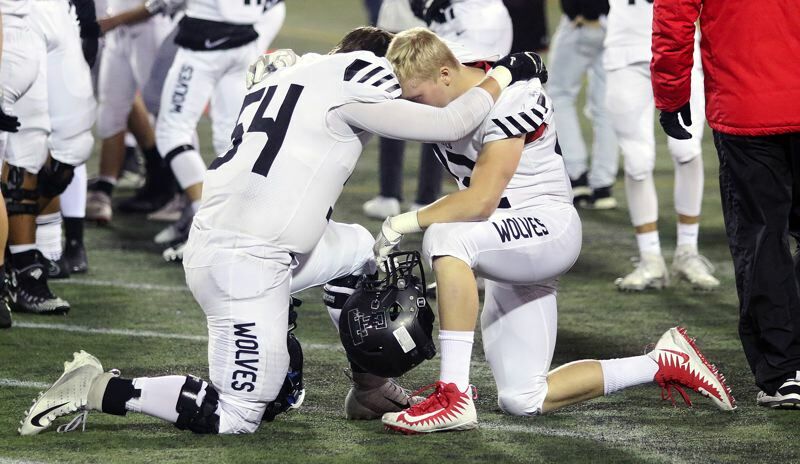 In fact, on the Wolves' ensuing possession, Miller had a 49-yard run to the Central Catholic 19-yard line. That helped set up an 18-yard touchdown pass from junior quarterback Blake Jackson to Searle, who made a reaching catch over the middle, giving Tualatin a 7-0 lead with 7 minutes and 21 seconds left to play in the second quarter. "We saw a single high safety, and I have to thank Blake," Searle said of the play. "He led me on a great pass and I just came down with it." The Timberwolf defense preserved that 7-0 advantage for the rest of the first half. "It was great," Boespflug said of the defensive effort. "It was unimaginable. We all just wanted to stop them." "They've got some really big stars on offense, with Silas (Starr) and Kalvin (Souders) and Elijah at running back. It's really hard to contain them, but our defense stepped up and did our job." 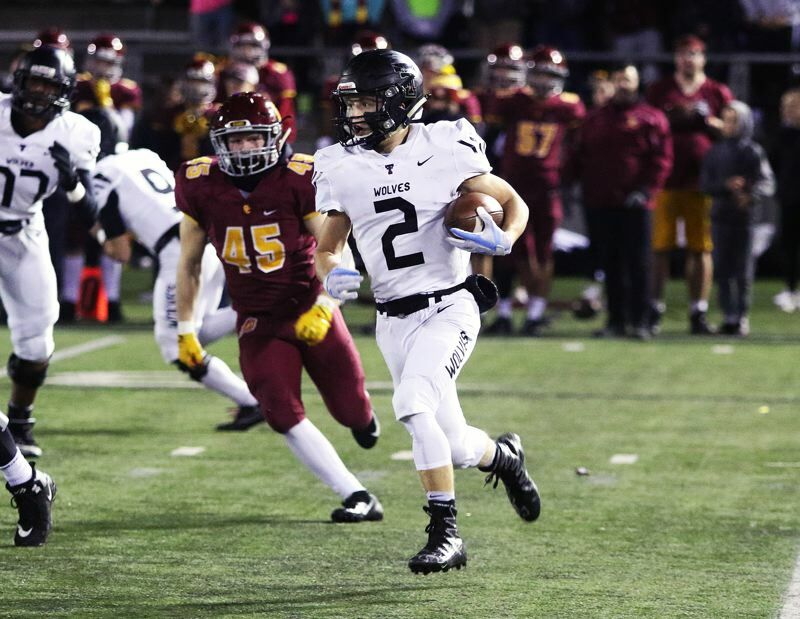 Tualatin senior defensive back Caden Dickson intercepted a fourth-down Central Catholic pass from the Timberwolf 34-yard line with 3:20 left in the second quarter. Boespflug then came up with an interception with 43 seconds left in the period. "I was going to decleat that receiver coming across, and then John (Miller) got to him first and tipped the ball in the air and I just dove for it," Boespflug said. The Wolves carried their momentum into the second half. 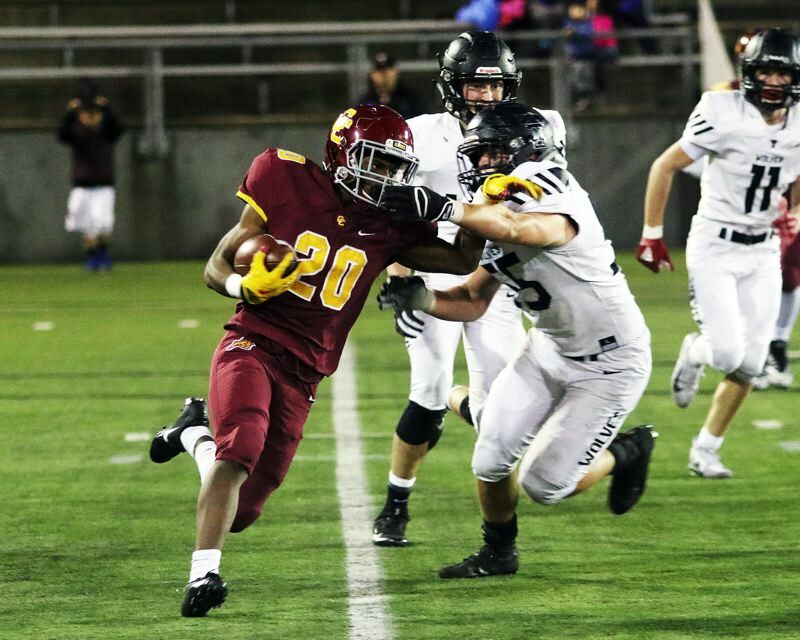 Following a kickoff return by senior Jalen Hale that gave Tualatin the ball at the Central Catholic 49-yard line, the Wolves marched right down the field. Loggins capped off the drive with an 8-yard touchdown run that upped the Tualatin lead to 14-0 with 8:30 left to play in the third quarter. The Rams battled back. 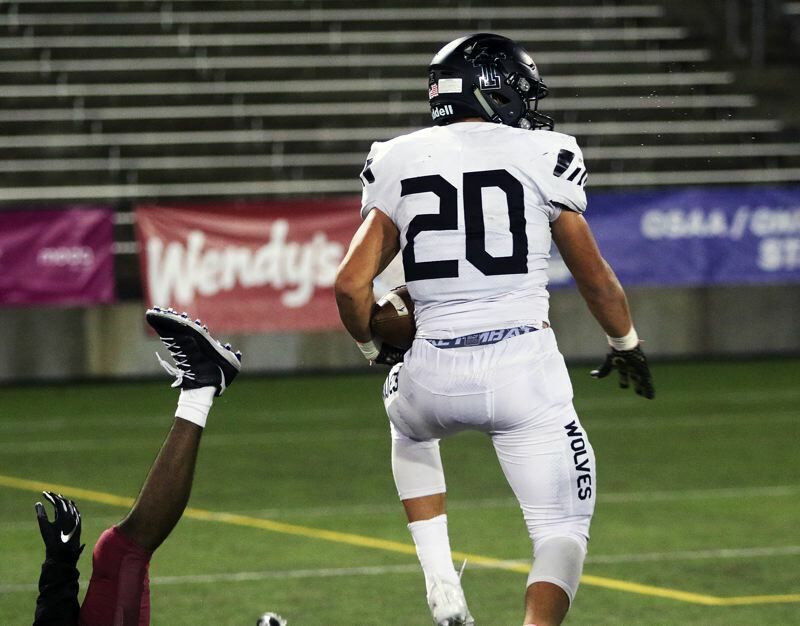 After junior Logan Nomura recovered a Tualatin fumble at the Timberwolf 15-yard line, Elliott scored on a 7-yard run to cut the Tualatin lead to 14-7 with 5:19 left in the third quarter. Tualatin would push its lead to 21-7 on a spectacular 47-yard touchdown play by Miller. After making an over-the-shoulder catch of a pass by senior quarterback Kyle Dernedde, Miller sprinted down the left sideline and then powered his way past — or over — a pair of Central Catholic defenders for the score, coming with 8:10 left in the game. "He had an amazing game," Boespflug said of Miller. "He's always doing his job, going above and beyond, exceeding expectations." It didn't take Central Catholic long to answer back. An 18-yard pass from junior quarterback Cade Knighton to Souders helped set up a 2-yard touchdown run by Elliott, which trimmed the Tualatin lead to 21-14 with 5:46 left to play in the game. It didn't take the Rams, and Elliott, long to strike again. On the first play following a Timberwolf punt, Elliott broke through a hole in the middle of the line and sprinted 77 yards for a touchdown, tying the game at 21-21 with 3:10 left to play. 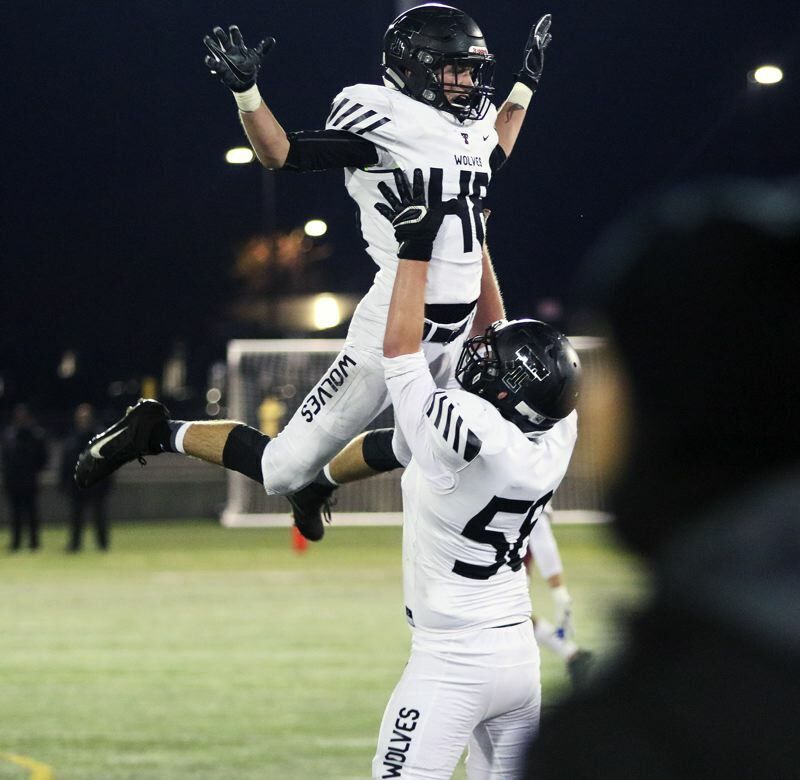 The Rams, after forcing Tualatin into a second straight three-and-out, had a chance to win the game in regulation, but a 27-yard field goal attempt, coming with with 15 seconds left to play, drifted wide left, and the teams went to overtime tied at 21-21. Central Catholic, with the first possession in overtime, where each team starts a drive at the opposing 25-yard line, got a 1-yard touchdown run by Elliott to take a 28-21 lead. It was then Tualatin's turn to try and answer back. 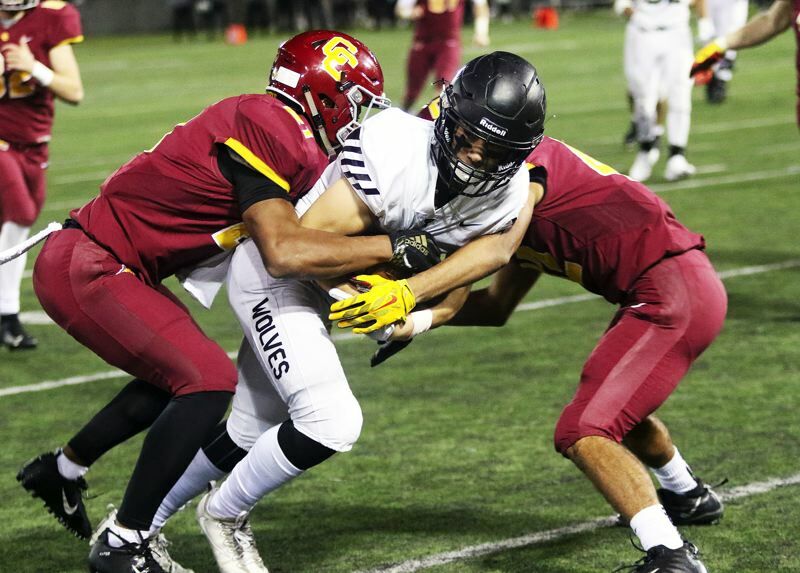 A 6-yard run by Loggins and a 9-yard pass from Dernedde to Searle moved the ball to the Central Catholic 10-yard line, where the Wolves had first-and-goal. Loggins gained two yards on first down. Dernedde then scrambled down to the Central Catholic 3-yard line. On third down, Miller, running hard to his right, looked to reach the ball to the pylon on the front of the end zone, but he was ruled down at the 1-yard line, where the Wolves faced fourth and goal. "I'd like to see that play again, with Miller on third down," Lever said. Tualatin fumbled the ball on the ensuing fourth down play. 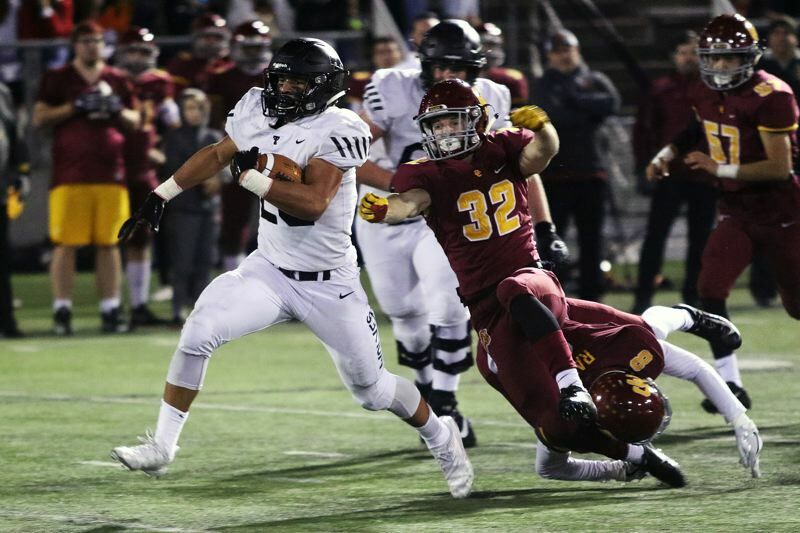 Tualatin senior fullback Kyle Kamp scrambled to get to the loose ball, but he couldn't get in the end zone, leaving Central Catholic with the 28-21 victory. "We just both battled back," Searle said. "It was a back-and-forth game. We didn't want to give up, that's for sure." "A lot of mistakes were made on our part," Loggins said. "I think we're the better team, but we kind of handed it to them." Loggins was the Wolves leading rusher in the contest with 104 yards on 22 carries. Miller added 57 yards on five carries and Jackson ran for 32 yards on nine carries. Dernedde completed six of nine pass attempts for 90 yards. Jackson completed six of nine passes for 54 yards. Miller had four receptions for 85 yards. Searle had two catches for 27 yards. For the Tualatin defense, Boespflug had an interception and quarterback sack. Dickson had an interception, Miller had a quarterback sack, junior Cody Van Meter, senior Dane Norlin, and senior Gavin Moore each had a tackle for a loss. "This season was amazingly fun," Loggins said. "I never thought I'd fall in love with football so much. This is my fourth year playing football, and I never saw it as something that would take me somewhere, but now it's my thing. I'm hoping I can keep thing dream going." "We started off, and people kind of doubted us, but we worked hard and tried to prove that we could play with anyone," Searle said. "This was a very fun season for me. I enjoyed the whole thing." 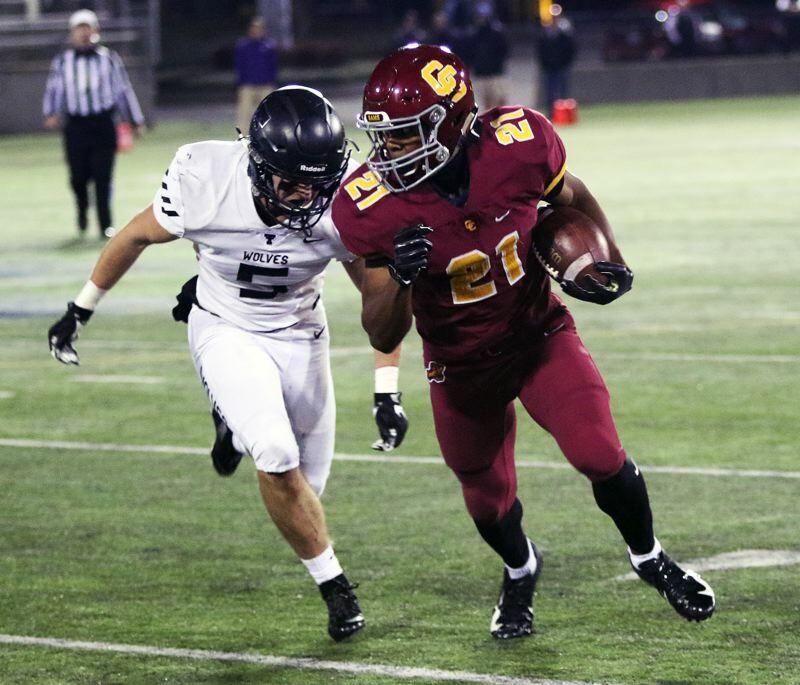 For Central Catholic, Elliott ran for 195 yards and four touchdowns on 29 carries. He gained 152 of his yards, and scored all four of his touchdowns, in the second half and overtime. Knighton completed 21 of 34 pass attempts for 196 yards. Souders had five catches for 64 yards, Starr had four receptions for 45 yards and junior Jaden Fulsher had four catches for 45 yards. For the Central Catholic defense, junior Clyde Bell and Nomura each had a fumble recovery and senior Hayden Martell had a tackle for a loss.